Already aural masterpieces, the world’s top opera houses and concert halls hardly need to be concerned with appearances – but when you’re reaching for perfection in performance, some symphonic visual stimuli can only add to the experience. 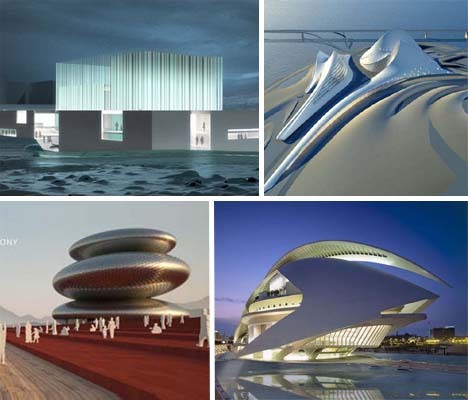 From the fluid, wave-inspired silhouette of Santiago Calatrava’s Tenerife Concert Hall in Spain to the mysterious shimmering island effect of the National Grand Theater of China, these auditoriums are just as magnificent as the music made within. 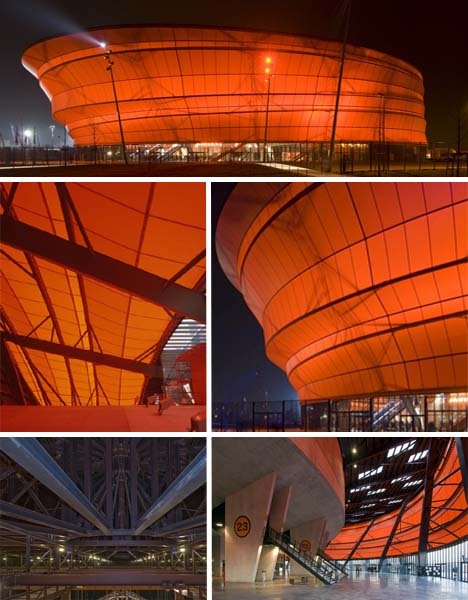 Like a gigantic paper lantern, the Zenith Music Hall in Strasbourg, France features a highly unusual façade of accordion-like folds of fabric on a steel frame which, when lit from within, gives off a warm glow. This membrane doesn’t just provide spectacular lighting effects, but plays a role in the all-important acoustics of the hall. 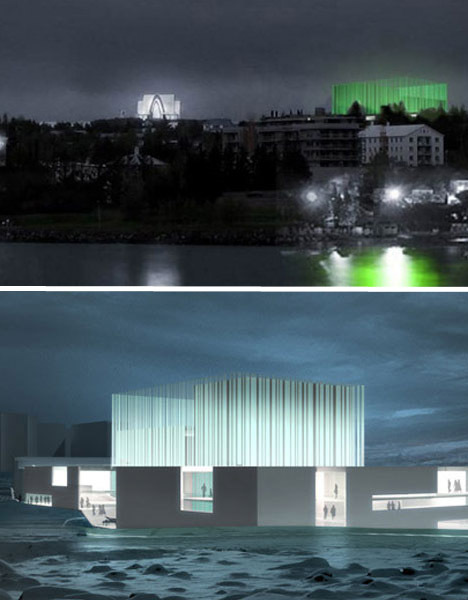 The new Icelandic Opera House will have a somewhat magical and otherworldly feel with its shimmering crystalline upper story, appropriate for its setting in an area that is said to be inhabited by elves. The glass cube, which will hold the opera’s large concert hall, will be filled with LED lights to change the façade’s appearance with the flick of a switch. Designed by Arkitema and the Icelandic architectural practice Arkthing, who won an international competition to helm the project. 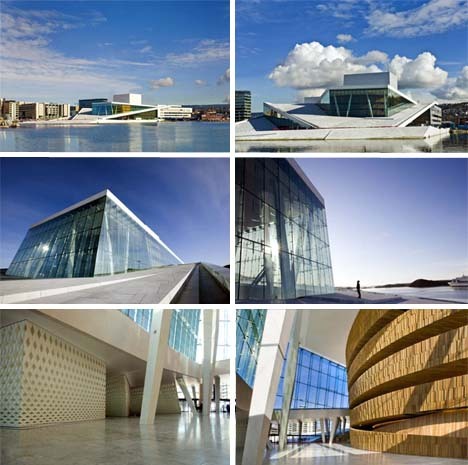 Ultramodern and geometric, the Oslo Opera House is a blend of three elements – the “Wave Wall”, the “Factory” and the “Carpet”. The Wave Wall is a nod to Oslo’s identity as a global harbor city, delineating the place where land and water meet. The Factory houses production facilities, while the Carpet forms a grand sloping horizontal surface that gives the structure a feel of accessibility. Just as Dubai’s landscape is known for its gently curving sand dunes and ocean waves, one of its centerpieces – the Dubai Opera House – will take on a similarly fluid shape with the emirate’s signature futuristic spin. 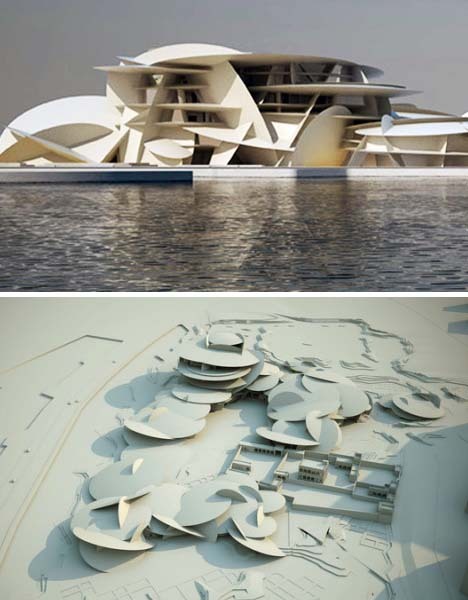 Designed by Zaha Hadid with Patrik Schumacher, the development will be a new cultural center in the Seven Pearls district. Another desert-inspired opera house in nearby Qatar takes its cues from Bedouin culture and is designed specifically with cool refuge from the hot sun in mind. Interlinked discs act as massive sun shades while steel and concrete will provide the thermal mass needed to hang on to chilled night air. The complex will seek LEED silver certification. 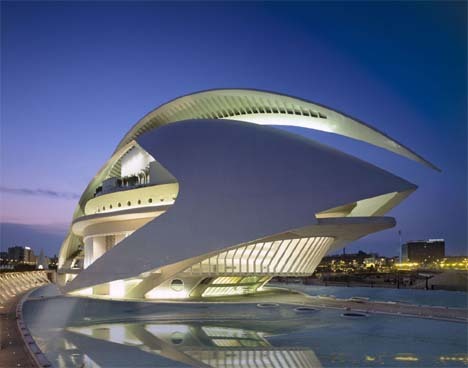 Famed architect Santiago Calatrava certainly grabbed the world’s attention with the design of the Valencia Opera House, a sweeping concrete and steel structure resembling a helmet that also calls to mind the movement of birds – a common theme in Calatrava’s work. Just as much an urban landmark as a functioning opera hall, the building is in the words of the architect himself his “most complete” work yet. 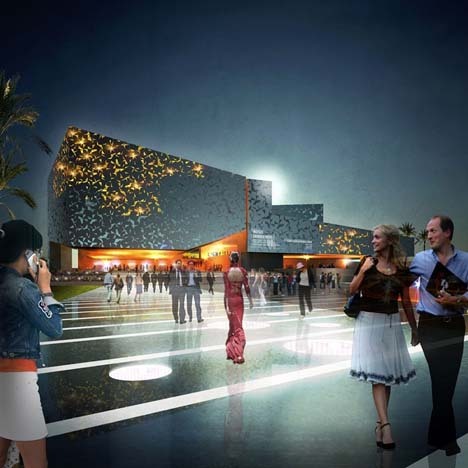 What is simply an interesting textured motif on the exterior of Lazarote, Spain’s Palacio de Congresos by day transforms to a volcano-inspired lava look when illuminated after dark. Designed by Henning Larsen Architects in collaboration with the local architect Carlos Morales, the Palacio de Congresos gives visitors magnificent views of the city, the mountain skyline, the sky and the ocean all from the foyer. 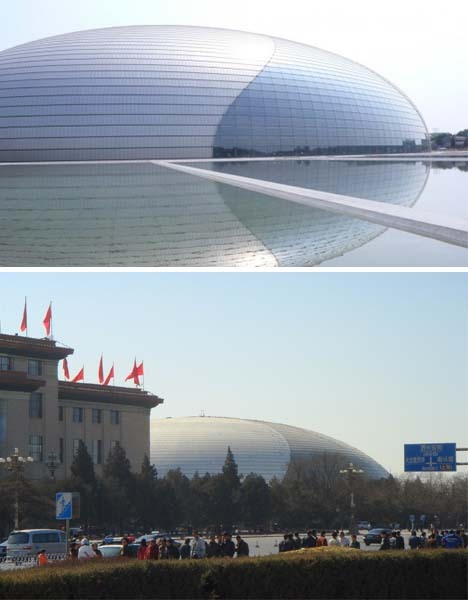 Maximizing the reflective qualities of both its glass and titanium exterior and the surface of the lake it sits on, China’s National Grand Theater resembles nothing so much as a gigantic metallic egg. Housing three performance auditoriums, the theater boasts an underground entrance as its only means of access, preserving a mysterious, island-like effect. The common use of seashell imagery in opera and concert hall architecture is no accident – consider how closely a spiraling shell can resemble the parts of a human inner ear. 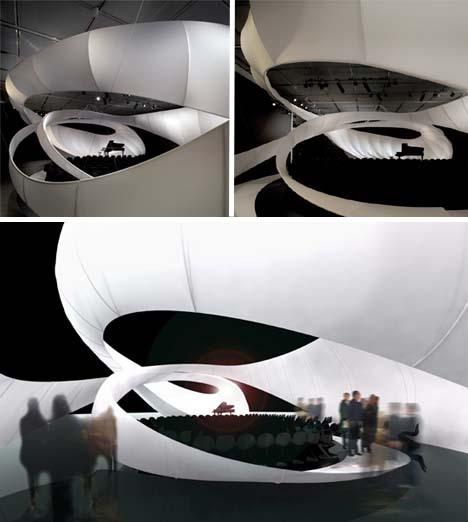 Though not a freestanding structure itself but a performance hall within the Manchester Art Gallery, Zaha Hadid’s Chamber Music Hall uses a swirling cocoon of fabric to achieve this visual effect and enhance acoustics. It may bear the name of Mickey’s creator, but the Walt Disney Concert Hall in Los Angeles certainly doesn’t look like anything you’d stumble upon in a theme park. 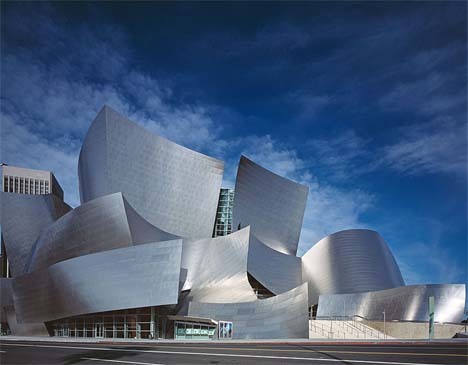 Designed by architect Frank Gehry, the curving stainless steel wonder was designed to be among the most acoustically sophisticated performance halls in the world. 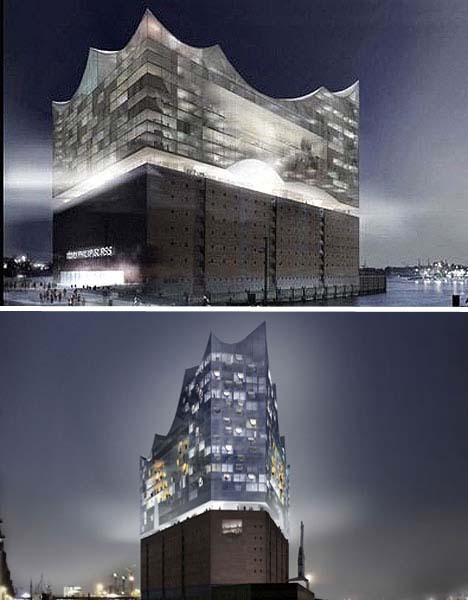 With its towering asymmetric glass auditorium, the Elbe Philharmonic Hall in Hamburg, Germany can’t help but evoke images of water and ice. Once completed, the new building makes use of an old gutted warehouse as a base and adds an upper glass structure that seems to float on air. The unusual design flouts the common auditorium layout, placing the orchestra and conductor in the center of the building. Much of the outer layer will contain a large parking garage. 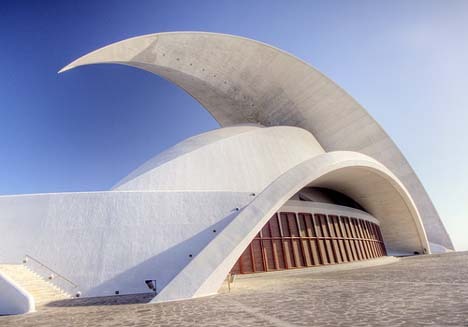 Curvilinear, sculptural and sparkling white: the Tenerife Concert Hall can’t be anything other than a seaside wonder, particularly with its distinctive ‘wave’ structure. As with many of Calatrava’s other buildings, the Tenerife hall seems to be ready for flight at any moment like some bizarre alien aircraft. 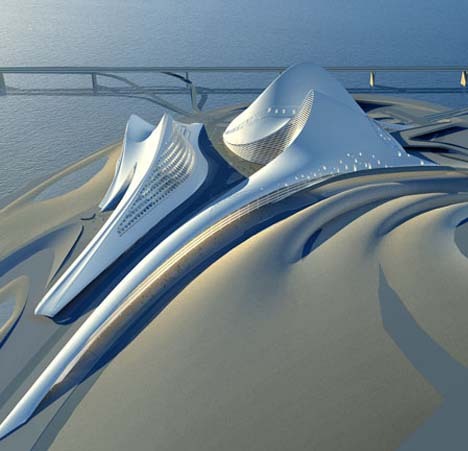 Speaking of UFOs, this concept for the Zhuhai Opera House in Guangdong Province, China looks a bit out-of-this-world as well. But the design is actually based on stacked pebbles in an attempt to capture visual balance while also maintaining a sense of movement. 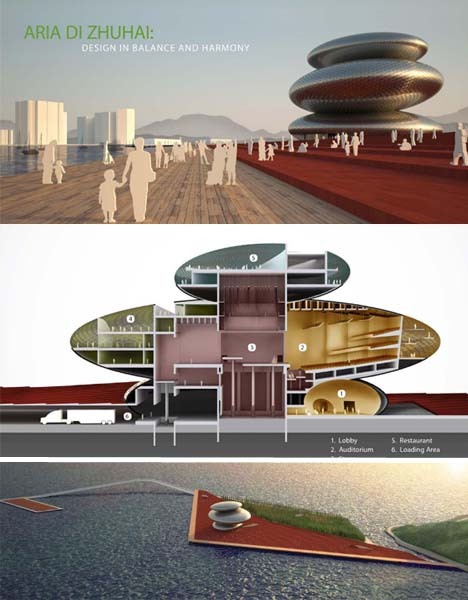 California’s SPF Architects allow the design to stand out even more by placing it on a contrasting red sandstone plaza that juts out into the sea. From the outside, the Mumuth Graz Music Theater in Graz, Austria may not look like much other than a particularly striking contrast to the surrounding old-world architecture – it’s a big box of glass. 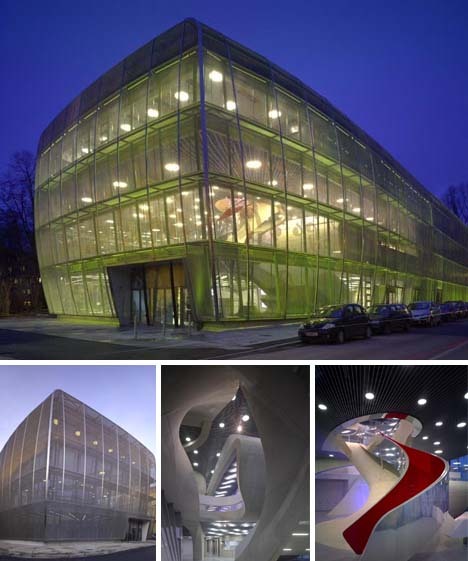 But the most fascinating part of this building is the great spiral staircase housed within, which almost seems like some living internal organ viewed through transparent skin. The staircase twists and turns and expands to accommodate interior spaces. 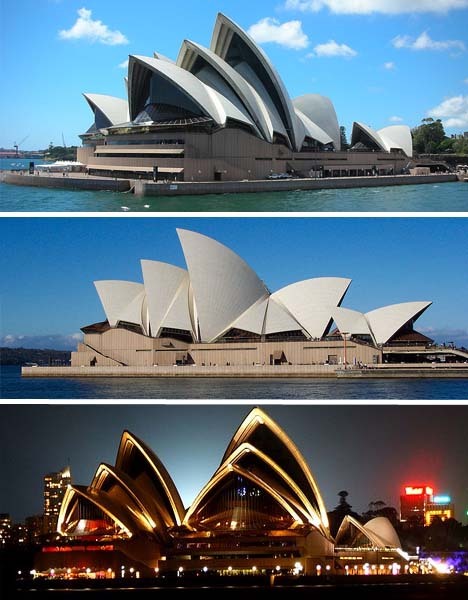 No collection of beautifully designed performance halls would be complete without the world-renowned Sydney Opera House. Designed by Danish architect Jørn Utzon and now a UNESCO World Heritage Site, Sydney Opera House is one of the standout buildings of the 20th century and is made up of a series of precast concrete “shells”.